I did think there were only two craft fitted with the Harbourmaster Engine Lee & Anne. Perhaps somebody can confirm this, also is engine type known? With ANNE and LEE, diesel outboard engines were fitted, LEE having a Harbourmaster, and ANNE having a Petter PD2. ANNE and the butty BERYL were tested on the London to Birmingham run, but the journey took longer than using conventional narrowboats. In 1963, seven of the River class were sold to Thames Conservancy, together with ANNE, LEE, and BERYL. I would like to set the record straight regarding this thread. Only two of these motors were built for 'British Waterways' southern carrying fleet, ANNE and LEE, and neither entered full carrying service. Period traffic records indicate LEE made two round trips to Birmingham and ANNE only one including returning empty to Bulls Bridge. The butty BERYL was certainly built with a removeable cabin, and it is believed that RAY was similar in its construction although I have seen no record to confirm this. The motor units did not rotate but had a 4 bladed Voith type directional propeller. Period photographs show the entire unit to be bolted to bearers that ran the length of the 'forks'. Much of the quote above seems to have originated from Robert Wilson's booklet 'Too Many Boats', but is not complete in its quotation. Either way this booklet is not entirely correct, and I have the tender forms for all of the boats sold to Thames Conservancy which has a close date of 06 November 1964. Thanks for that info. Looking again at ANNE, I see what you mean. Presumably almost any engine could be used. Were they both fitted with PD2s? I seem to remember the one I saw on the River sounded like a Petter. Not many people would know about them, apart from Thames users. They were used on the River at least until the seventies. My knowledge of the river mostly ended in 1975. Any idea what they (whoever they are) use now? The Weaver photograph of ANNE earlier in this thread looks like a Petter PD2 to me, and the photograph here of LEE is certainly a Petter PD2. I last saw LEE underway at Henley on Thames in 1997 and although it still had a Harbourmaster type unit I am sure it was powered by a four cylinder diesel. Anyone know what that bar or tube, clipped to the bearer, under the steerers seat is for? Wondering if it's for raising the drive leg, via the cable/ hawser at the far side. I like the sound of a PD2, but not enough to want to sit there for very long! I struggle to tell the difference between the sound of a Petter PD2 and a 2 cylinder Lister H series, both being a bit clattery. The sound of the exhaust will of course depend on the silencer and whether a titch or stack / tall pipe is fitted. If I had to choose one or the other I would go for the Lister as I do not like the belt driven cooling fan on the Petter. Nice to see your comments on the site, Pete, It is also nice for the confirmation and details. 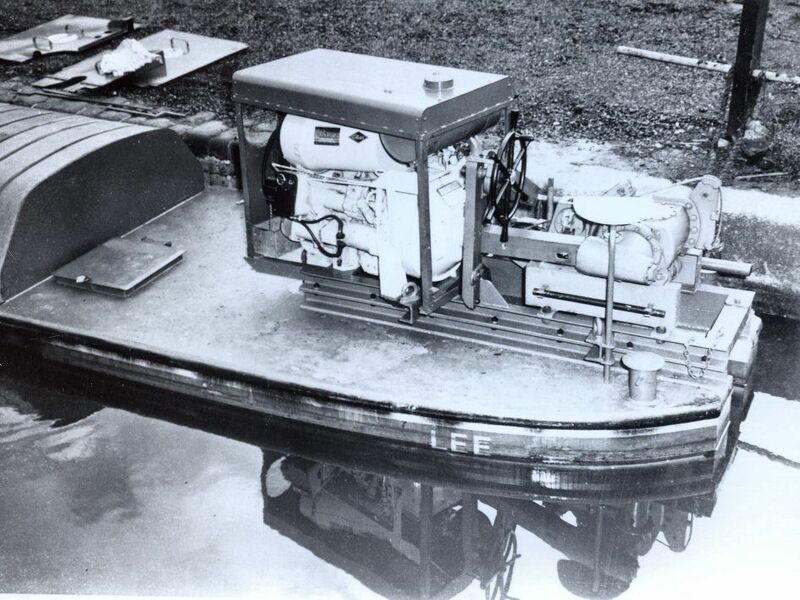 With regard to outboard engine installations, I came across this 1960s German photo on http://www.deutschefotothek.de. He has got a nice wheelhouse and probably can't hear the engines. Jealous. note to self....next time read the header. The EA Thames do still have a barge with sewage tanks on it but its usually towed by their tug "Churn" and I think its a modern barge although I have never thought to check it out. Its wider that a narrow boat. 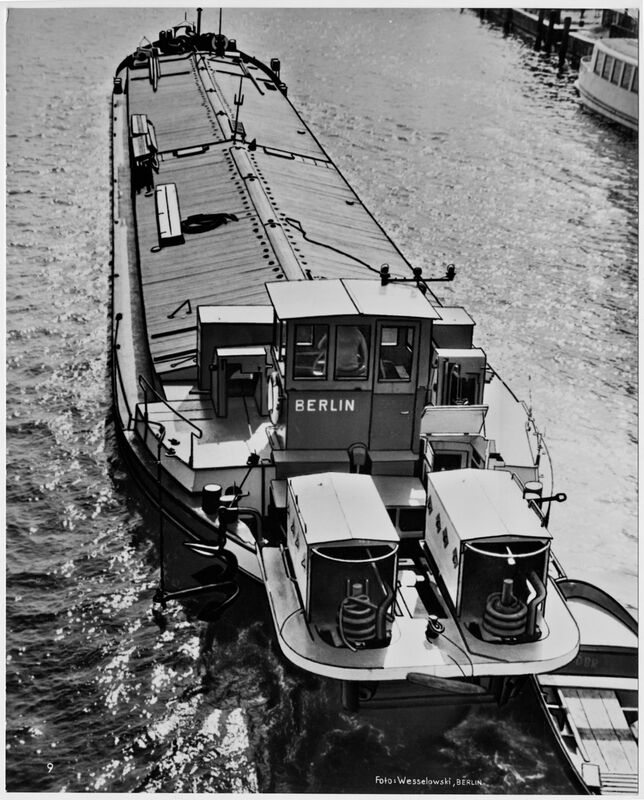 The EA Thames do still have a barge with sewage tanks on it but its usually towed by their tug "Churn"
Thanks for that. Seems a waste of manpower, the old one was a one-man job. You could always try Barcroft's semi-immersed propellor, though from the report of its use on the L&LC, I would suggest avoiding them. 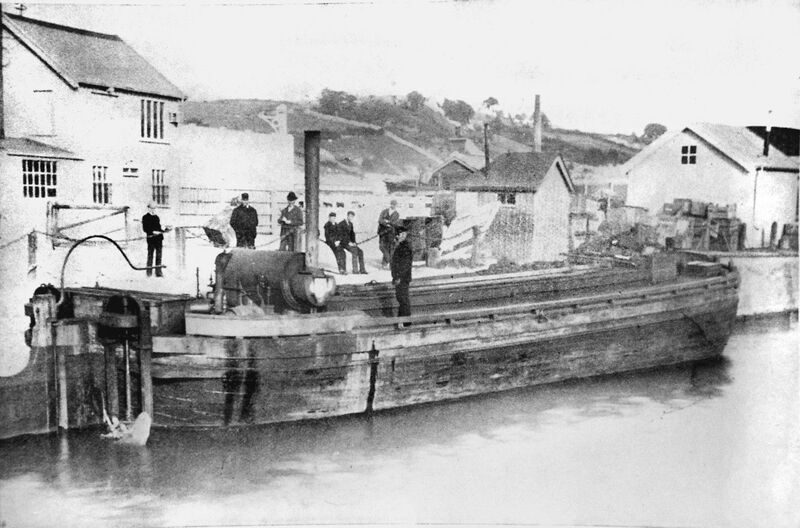 They seem to have worked on the Newry Canal though. Fair point and you could well be right. It seems an odd location for a winch handle as it would get used as a step in that position. But could well be exactly what you suggest. Isn't that slot above it a lubrication point for a chain drive to the gearbox? 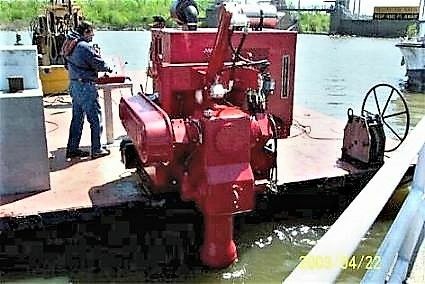 The firm in America produces barge propulsion engines, or did to, a large size.